Fed up with expensive air suspension repairs? Need simplicity and increased reliability in harsh environments such as severe off road and expeditions? This air to coil conversion kit is just the answer. 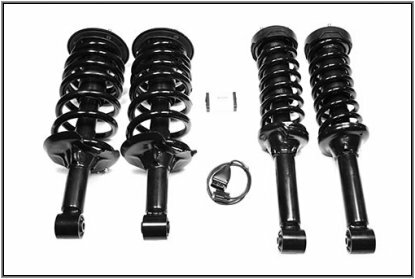 The kit includes front and rear coil over struts and all hardware as well as an electrical system override module to tell the vehicle that it no longer has air suspension and a full set of instructions. Manufactured by Dunlop, the kit can be fitted by any workshop or a competent DIY mechanic.